Say goodbye to paper and email payslips with this secure, online electronic payslip solution that also distributes P60s and pension communications. Emailing payslips could land you in court for breach of data protection. Sign up for a free trial and find out for yourself how IRIS OpenPayslips can streamline your payroll process and keep your business compliant wth auto enrolment legislation today. The secure web based solution that enables your employees to access, and download their payslips via an online portal via PC, Mac, smartphone or tablet. IRIS is the only payroll software provider that allows you to deliver your employees' payslips direct to their smartphone! IRIS OpenPayslips also delivers P60s and pension communications electronically in order to comply with auto enrolment legislation. Free for accountants and their employees! IRIS OpenPayslips is completely free for accountancy practices to use to pay their employees. This service allows accountants to see just how much IRIS OpenPayslips streamlines their payroll process. All user passwords are ‘Hashed and Salted’. Hashing means that IRIS OpenPayslips only stores encrypted passwords and therefore it is not possible for anyone to view an actual password in the database. Salting means that even in the instance of an attempted attack, it is not possible to crack the encrypted password even if someone were to gain access to our user access database which is protected by Microsoft’s Windows Azure built in security. Only the actual user of an account sets their password; not even the system administrator can set, view or change an individual user’s password. The only way a password can be reset is via a uniquely generated password reset link that is emailed to the user. 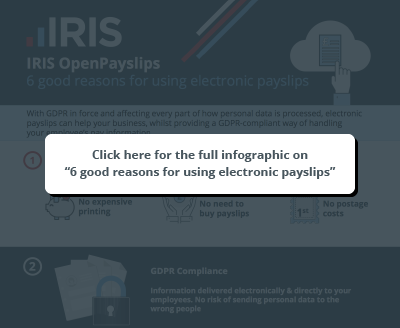 Adopting IRIS OpenPayslips can help to increase your business' payroll processing efficiency by cutting down on printing, sorting and sending paper payslips. In addition to this, it will enable you to reduce the costs associated with paper payslips and P60s whilst reducing your business' carbon footprint in the process. IRIS OpenPayslips is a 24/7 fully accessible service which means that your employees can access their account and their documents whenever they may need them. In addition to this, they are less likely to lose payslips and don't have to ask for duplicates to be printed should they need them. The accounts are fully managed by the employee meaning that they have complete control over their own login details and security. Employees have to be informed at key stages in the automatic enrolment process. The communications required will be set by their worker status and what stage they are at in the process, and the triggers behind this are complex. If you have the IRIS AE Suite™ then IRIS OpenPayslips will take care of your communication requirements. This will remove the administration and distributing pension communications electronically. IRIS has worked closely with The Pensions Regulator to ensure your workers receive the right communications at the right time. The IRIS OpenPayslips app can be downloaded by employees for smartphone and tablet as well as being accessible via desktop. The payslips, P60s and pension letters are organised clearly into groups allowing you quick and easy access to the documents that you need. Need a payslip from 6 months ago? No problem, simply scroll through your payslips and locate all of your previous documents quickly and efficiently! From within your payroll software you are able to select those employees that would like to receive digital payslips. You simply press the publish button and your employees will receive an email inviting them to register their account and create a secure password. Employees can then log in and view their current and historic payslips. The employee can access their payslips wherever there is an internet connection, 24/7 and will be displayed exactly how your employees are used to seeing their payslip. How much time could you save with digital payslips? Attend one of our 10 minute complimentary online demonstrations to find out. Select from the options below to book your place. IRIS OpenPayslips features in Payroll World's "Digital Paper"
IRIS OpenPayslips can save you time and money! There are now officially more smart devices on the Earth than people!